A man standing in line at a coffee shop in California was kicked out after he harassed a Muslim woman wearing a niqab, a video shared online Saturday shows. Shared on Twitter by journalist CJ Werleman, the video shows an unidentified man asking a woman wearing a Muslim headdress that covers everything but her eyes if it's Halloween, then informing her that he doesn't like her religion. The coffee shop the incident was filmed at has been identified as The Coffee Bean and Tea Leaf. It's unclear at which of the store's locations in California the harassment took place. 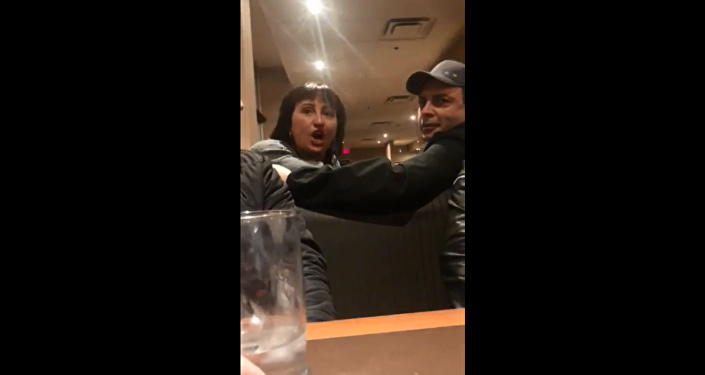 The video begins as the woman asks the man to repeat his statement. ​"I said is this Halloween or something?" the man says. The woman responded by confronting him and asking why he would make such a comment. He fired back with "why wouldn't I?" After identifying herself as a Muslim, the female customer asked the man what his problem was. "I don't like it, that's why," he said. "I don't like your religion, it says to kill me and I don't want to be killed by you. How's that?" Remarking that he's read some of the Quran, the man added that he had "read enough" to know that he was speaking the truth about Islam. While the two are arguing over religion, an employee tries to separate them before another customer decides to speak up and tell the man to "get out of here" and later calling him a "f**king racist." The edited video later cuts to the man who made the anti-Muslim comments being denied service. After getting the manager and the present supervisor's name, he leaves the establishment. When the Muslim woman asked why the man was being denied service, the supervisor explained that "he is disrupting a public place and being very racist." Netizens reacting to the footage have praised the supervisor and those who spoke up for the woman. ​The Coffee Bean and Tea Leaf has not released a statement on the matter.